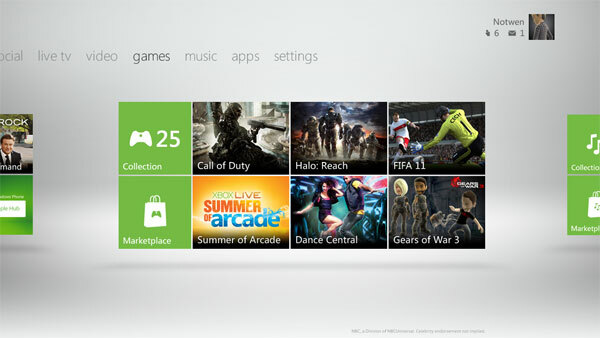 Autumn is fast approaching -- and you know what that means: it's round about time for an Xbox Dashboard update. Sure, we got a peek of Microsoft's upcoming harvest back at E3, but the good folks from Redmond invited us to take a closer look at what they're calling the "most significant update to the Dashboard since NXE." Senior project Manager Terry Ferrell was on-site to walk us through an early engineering beta and show us how an updated Metro UI, Bing search and deeper Kinect integration is going to change the way folks manage their entertainment content. The pseudo-cross-bar navigation of today's Xbox 360 dashboard is gone, replaced by a logical extension of last year's dashboard update -- that is, more Metro. Whereas the current dashboard spreads your channel content across a row of large panels, the fall update allots only a single screen of real-estate per category. Despite the new layout's single-screen confinement, it feels more refined than cramped. The entirety of a category's options are upfront and ripe for the picking, without the need to sort through a lengthy list of options. Most section layouts consist of a single large tile cycling through "spotlight" content surrounded by an assortment of smaller tiles hosting the category's primary functions or popular apps. 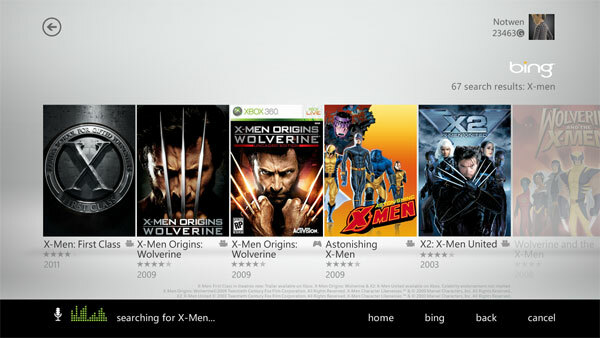 A row of categories headline the top of the screen, placing games, social, and other sections between the new Bing search feature and the console's settings page. Some of the familiar categories have been renamed, and are sprinkled with new features. "My Xbox," for instance, is now "Home," and sports a handy "Quickplay" button similar to the current Dash's "Quick Launch," listing not only recently played games, but apps (such as Netflix) as well. The new UI invokes a tablet-esque interface, and feels very much like how we imagine a Windows 8 tablet might. It's almost as if the design team simply tipped a Windows Phone on its side and tossed in a dash of old-school Zune for good measure. Although the new look failed to pique our interest at E3, seeing it in action makes all the difference -- it's sleeker, more efficient, and a full Xbox realization of Microsoft's Metro look. Those of us who weren't sold on the Kinect sensor as a video game controller had to at least admit that it would nice to couch surf without having to look all over the living room for that danged remote -- and the Dashboard's deeper Kinect integration takes us one giant leap closer to that lazy dream of clicker-free TV. 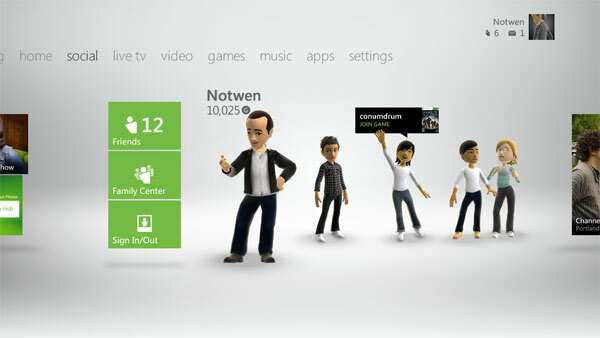 Sure, you can still navigate the new Dash with the standard Xbox 360 controller, but there's over 10 million Kinect owners out there just dying to go Minority Report all over this new interface. Lucky for them, Microsoft seems to have kicked the Kinect hub out of its exclusive little corner and made it play nice with the rest of the Dashboard: gesture controls now work almost entirely across the board. The simple gestures we saw were little more than swiping back and forth across the screen to switch categories or air-pawing at a tile to select an option -- it wasn't much, but it was enough to once again remind us of an over-sized tablet interface. The natural, intuitive controls are very much built off of experiences we're already familiar with, and feels accordingly comfortable. From here, the new Dash's Kinect controls look to be a solid answer to our lost remote woes. Sometimes lifting a finger is just too much work, even without a remote -- good thing then that the new Dash is willing to lend an ear to your bossy commands. Controllers and arm waves are fine, but there's nothing like telling a computer (or game console, as it were) what to do, Star Trek style, and have it actually do it. Our host showed us the ropes by using the update's new search feature, kicking off a content crawl by saying "Xbox, Bing Batman." Sure enough, the screen was soon filled with a multitude of Bat-content, pulling up movies, games, TV shows, and even a soundtrack. The results were then pared down further, "Xbox, show movies," filtered out the TV, game, and music content, leaving only Bat-flicks to choose from. Terry told us that this kind of voice control, alongside Kinect gestures, will be present throughout the new Dashboard -- with the exception of console's settings menu, which can only be navigated via traditional controller. Unfortunately, that's where our Bing and voice control demo stopped -- the build we were seeing simply didn't have all of the necessary features implemented. Still, what we did see was accurate and responsive -- so much so that when Terry casually mentioned that one of the items on the home screen was "open tray," it did. On second thought, maybe it listens a little too well. The problem with early developer builds is they are occasionally incomplete. Our host mentioned that while some of the features he described to us were working in the lab, they just weren't available in the preview he showed us. Bing search, for instance, was said to go even deeper -- capable of performing a cross-catalog search of selected content. Had we actually decided to watch that Batman movie, we would have been shown its price and availability in all of the services and apps available to Xbox Live. Sure, we could buy it on Zune, but maybe Bing told us it was available to stream through our Netflix subscription. The search can even pull data from live TV on-demand services, such as Sky TV. Terry also mentioned that more content partners were on the way. The Dashboard is also primed for a modest social overhaul -- in fact, the "My Friends" section of the Dash has been renamed to just "Social." Beacons, which were briefly mentioned at E3, will let you broadcast a gaming event to your Xbox Live community, toasting a notice to your friends that you want to play. Beacons can also be pushed to Facebook, offering another way to pester your pals into logging in. Speaking of spamming up newsfeeds, achievements can also be posted to Facebook from the Dashboard, and developers will be able give players the option to post game-related updates to their wall as they play. It's always hard to accept change, but we feel pretty comfortable with Microsoft's new status-quo. The new Dash's full-on Metro interface looks much sleeker than hallways of panels we're scrolling through today, and there's comfort in the cross-product conformity it shares with the Windows Phone and Windows 8 platforms. The near system-wide Kinect and Voice integration both make navigating the menu a bit more of a "whoa" experience, and eliminates the on-screen keyboard chicken-peck that might have made the new Bing search function irritatingly cumbersome. Yes, change is hard -- but if the final update is as slick as it's sold, I think we'll manage. We'll let you know how it goes when the beta launches next month.